Do you feel like Royalty tonight? How about an Emperor’s Herbal Chicken? Sounds so majestic and looks so complicated but it is a no fuss and wholesome dish!!! Living in a hectic urban society like ours, it is always good to eat well and nourish our bodies with nutritional dishes. According to the Traditional Chinese Medicine, Emperor’s Herbal Chicken is a fantastic energy booster if you are 1) mentally exhausted, 2) over-worked, 3) have insufficient sleep, or all the above. 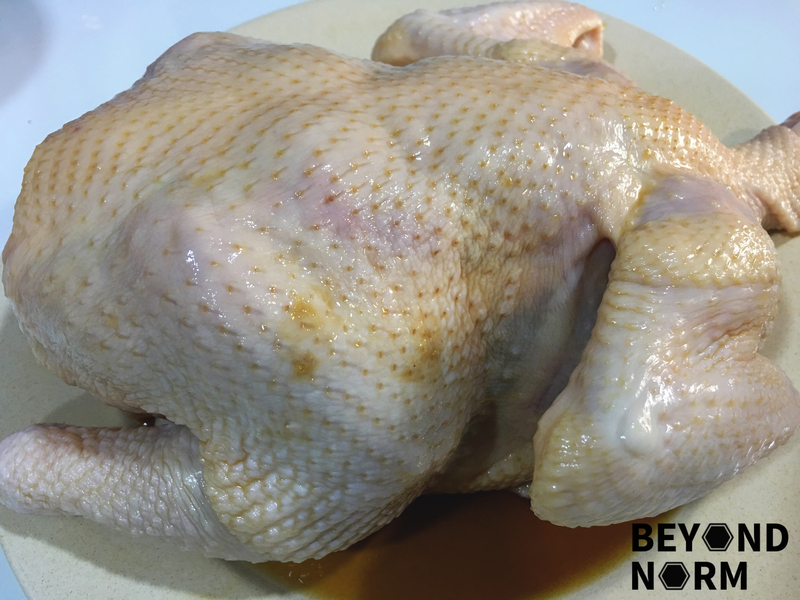 After 2½ to 3 hours of steaming on medium-low fire the chicken meat is soft, moist and filled with the sweetness and goodness of the herbs! 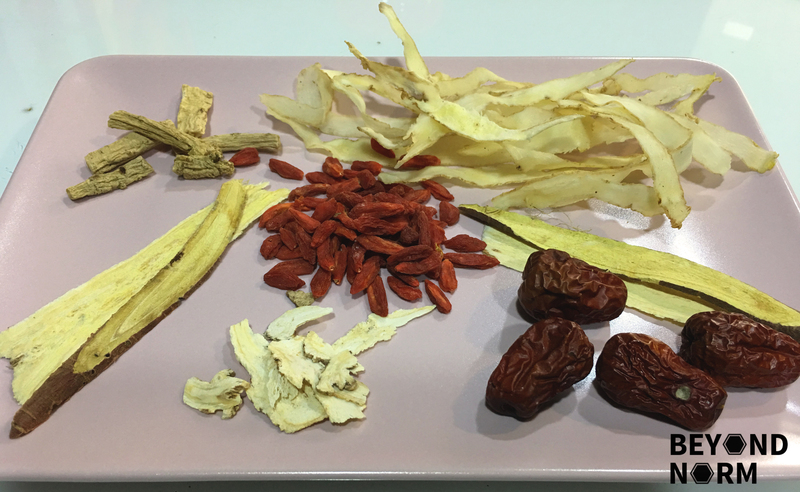 As usual, I will encourage our readers to try using these dried natural herbs which are easily available in Asia, or in the Asian markets if you are out of Asia. Remove the feet and the bishop’s nose from the chicken. Clean and wash the cavity of the chicken. Rub the skin and cavity of the chicken with 2 tablespoons of salt. Then, wash the skin thoroughly and pat dry. Rub the chicken with the light soya sauce and some salt. Then let it stand for 20 minutes. Lightly rinse all the herbs. In a small pot, add in the water and bring it to a boil. Add in all the herbs, except the wolfberries, and simmer for 15 to 20 minutes. Add in one tablespoon of salt to the herbs mixture and stir well. Sieve the herb mixture and retain both the herbs and the liquid. 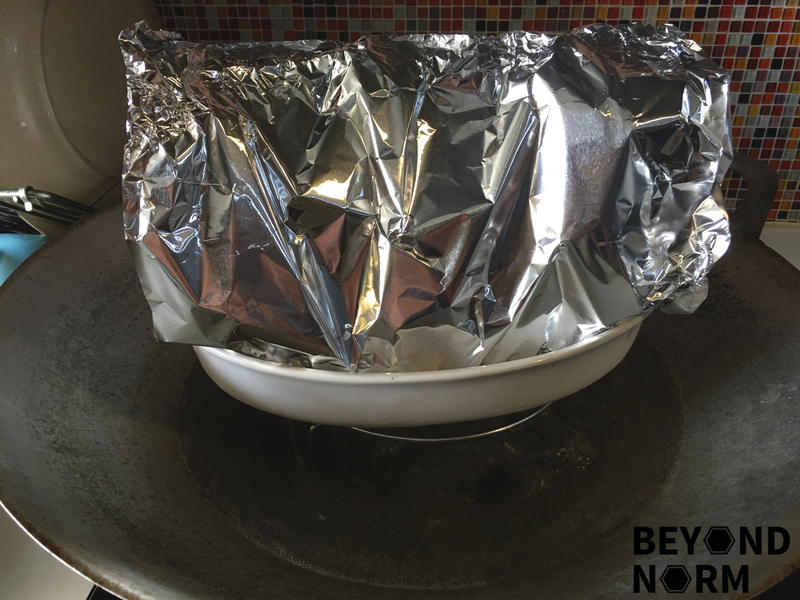 Line a dish with aluminium foil and baking paper. 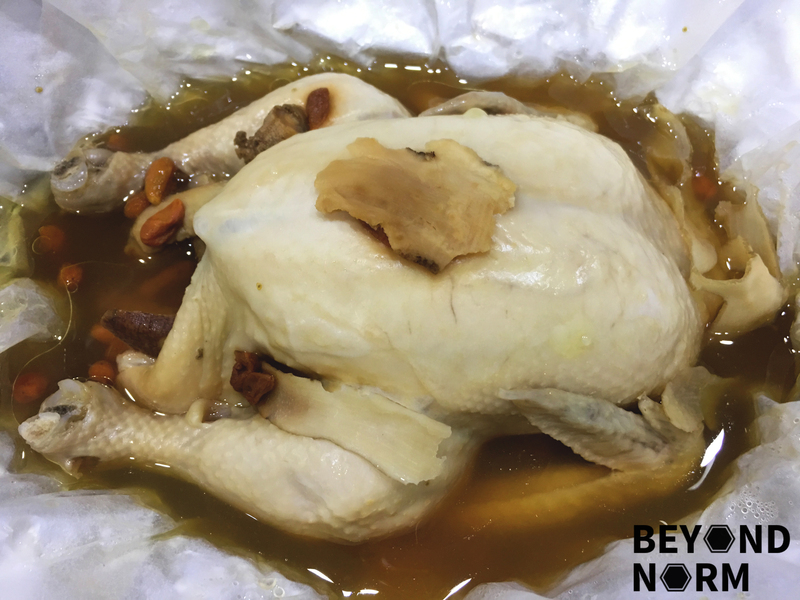 The baking paper should be large enough to loosely wrap around the chicken, while the aluminium foil should be large enough to wrap around the baking paper and chicken to make a seal. Place the chicken on the lined baking paper and insert the boiled sieved herbs and the wolf berries into the cavity of the chicken. Place some of the remaining herbs on top of the chicken. Pour all the liquid from the herbs mixture onto the chicken. Seal the chicken by loosely wrapping the chicken with the baking paper. Then fold the aluminium foil into a parcel to ensure the chicken is completely sealed. Fill a wok with water till it reaches the steaming rack and bring it to a boil. Once the water is boiling, place the dish with the chicken parcel onto the steaming rack, and steam the chicken for 2½ to 3 hrs over medium heat. 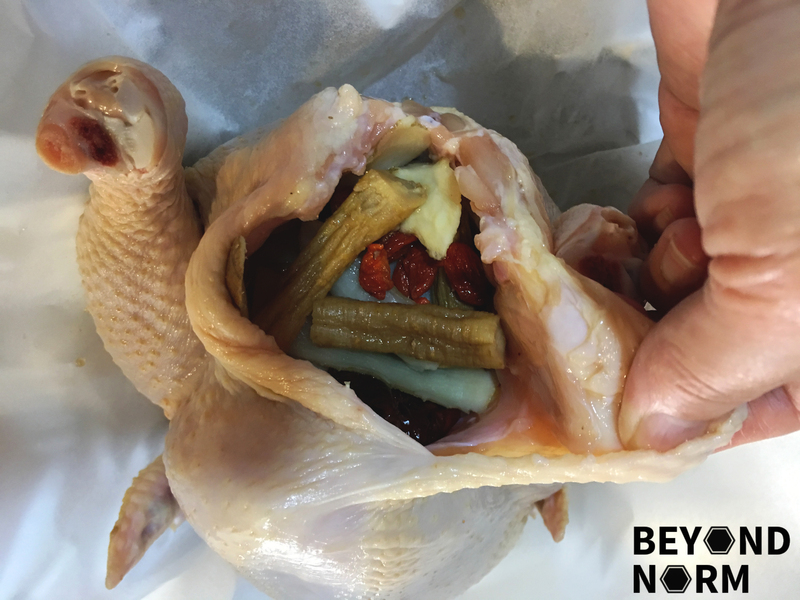 When the chicken is done, slowly unfold the aluminium foil and baking paper and pour in 2 tablespoons of Shao Xing Wine then fold it back again until it is ready to be served. Caution: Be very careful when you unfold the aluminium foil because the steam will be scorching hot. Rubbing the chicken with light soya sauce is just to enhance its taste and to give it a nice colour when it is cooked. For the best results, the amount of herbs and the timing given above would work best with a medium sized chicken instead of a large chicken. 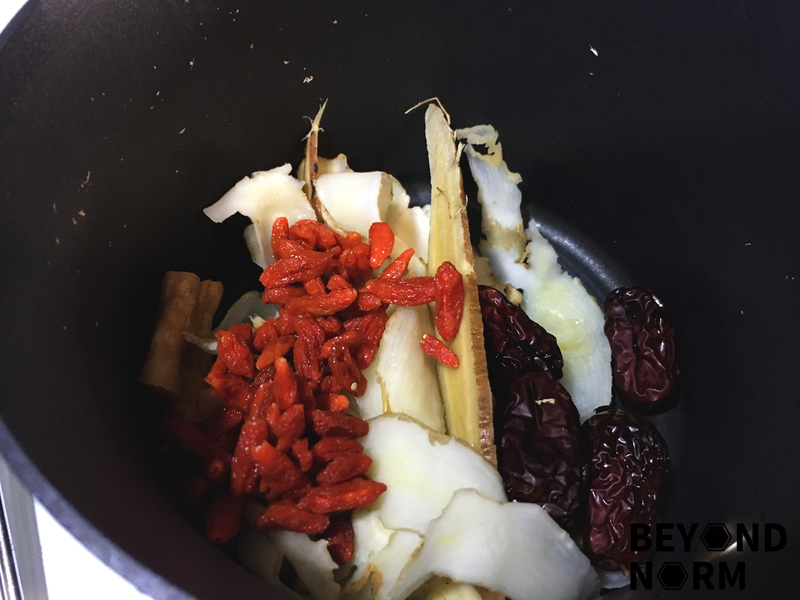 If the Wolfberries are boiled for too long, it will cause the herb mixture to be sour-ish so it is best to add it in last. Make sure there is sufficient water to steam the chicken. Too little water will not produce enough steam, this will cause the chicken to take a longer time to cook and the flesh will not be as soft and tender. If you need to top up water during the steaming process, make sure you use boiling water to top it up, otherwise the change in temperature will affect the cooking time.